Colorize your watch! Fintie protective bumper case for 42mm Apple Watch. Includes 3 easily interchangeable colors (2 pieces for each color) to protect your watch from scratches and maintain that shiny bright appearance. Designed for 42mm Apple Watch Series 3 (2017) / Series 2 / Series 1 / Original (2015) Nike+ Sport Edition All Models, Not for 38mm Apple Watch. 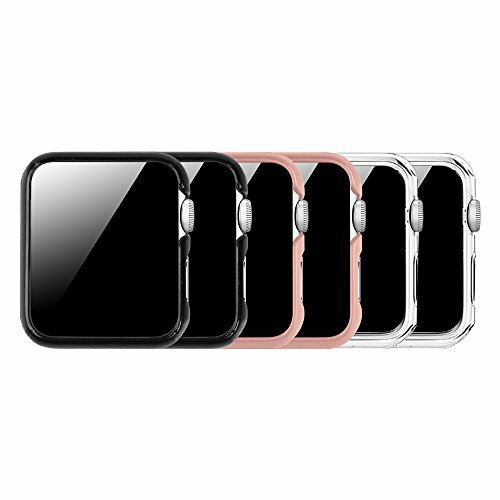 Specifically designed for All Versions 42mm Apple Watch Series 3 (2017) / Series 2 / 1 / Original (2015). NOT FIT for 38mm Apple Watch.